Jungle is a primary biome type characterized by many tropical trees and ground growth growing closely together. Jungle planets are a 'dangerous' threat level, geared toward tier 4 in progression. Avian villages and dungeons are most abundant on jungle planets. Jungle biomes can be created and expanded using a Jungle Terraformer, and a planet will convert to a Jungle planet once half of the planet's surface has been terraformed into Jungle biome. Jungle planets can be found orbiting radioactive (yellow), frozen (blue) and fiery (red) star types. Unless players have a Radiation EPP Upgrade equipped they'll perpetually take damage from deadly radiation while on the planet. Possible mini biomes inside jungles are giant flower, which has large flowers in place of trees, swamp, characterized by muddy water and swampy tress, eyepatch, with a variety of plants which resemble eyes, and mushroom patch which has large mushroom trees. Adult Poptop, Bobfae, Crustoise, Crutter, Poptops, Scaveran, Snaunt and Squeem have a chance of being found in jungle biomes. A jungle; landing site densely inhabited by flora and fauna of many kinds. The area is rich with resources but phenomenally high in radiation. High levels of radiation render this jungle location an extremely hostile environment and local fauna is similarly unwelcoming. The landing site is in a dense jungle. A menagerie of astounding creatures live amongst the lush flora. It is a shame about the lethally high levels of radiation. The surface layer of jungles is primarily made up of dirt. There's an abundance of gatherable wood because of plentiful trees. The planet's primary color in the navigation console and while orbiting above is the primary color of the dirt found there. Mid game ores are found in jungle biomes, with copper, silver ore, gold, titanium and durasteel available near the surface. The surface of the ground is mostly covered in grass and bushes, and the topography is often hilly with small subterranean caves. Jungle biomes use their own two sets of music tracks for day and night. 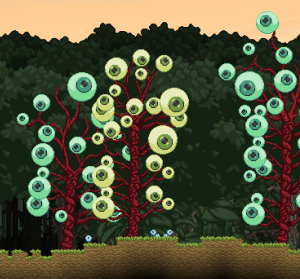 Trees in eyepatch mini biomes appear to have large eyes. There are sub biomes which can be found on jungle planets in addition to their unique mini biomes. Garden, savannah, mutated or forest have a chance to appear as smaller biomes on jungle planets. These biomes will include things like their associated blocks, trees, and crops when they appear. Mini biomes for each of these secondary biome types can appear inside them as well. 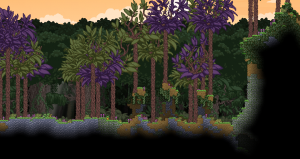 Jungles can also be found as sub biomes on forest or mutated planets. Giant Flower, Mushroom Patch, Eyepatch, and Swamp are unique mini biomes found inside jungle biomes. These mini biomes can be found on jungle planets or inside jungle sub biomes on other planet types. Each has their own creatures and items outside what's available in jungle biomes. The most distinguishing characteristic of jungle mini biomes are their trees; a different type is unique to each mini biome. Eyepatch - A number of plants and trees which resemble large eyes. Jungle planets stick to the standards for planetary layer composition. There are a large variety of harvestable crops found in jungles. These can be harvested by interacting with them or by digging them up. They'll drop produce and have a chance to drop a seed which can be replanted. In addition to procedurally generated creatures, there are a variety of unique monsters, bugs and critters found in jungle biomes. Some of these are also found in other biomes, while others are unique only to jungle biomes. While these unique creatures have a chance to appear on jungle planets, they will not all appear on each one. In addition to unique creatures, each biome has multiple types of both procedural ground and flying creatures. There are a variety of items which are specific to chests found in jungle biomes. Some of these may have a chance of being found in other places throughout the universe, but they've all been specifically allocated to chests within jungle biomes. Chests in jungles also commonly contain bio sample. Jungles can have a large variety of settlement types found on them. These include small microdungeons and NPC camps, larger racial villages and hostile dungeons. Smaller jungle planets usually contain only one dungeon or village, while larger jungle planets can contain as many as three. Jungle planets are the best place to find Avian dungeons and villages. They're much more likely to appear on jungle planets then any other type.